The way the sunlight streams through the wooden slats of Simon NH’s carpenter’s workshop shows not only exemplary building skill, but also quite the talent with the camera. This idyllic scene of a bygone age of craftsmanship matches nifty piece uses, such as the minifigure hair wasp’s nest in the rafters, and the subtly positioned gear rack saw blade, against an eye for pictorial representation. 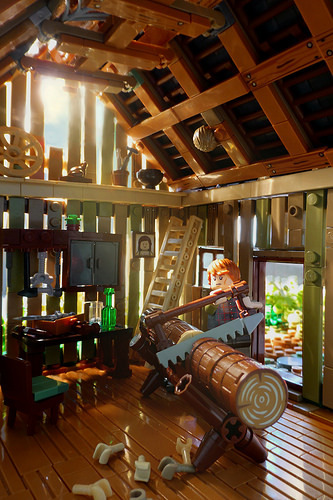 Using the lines of the beams and rafters to exaggerate the perspective in the photograph, Simon pulls the viewer’s eye into this little world, able to linger over every detail of the carpenter’s life; and be rest assured those minifigure hands on the floor are wood chips and not the result of a grisly accident.